Get your referral code & template through the MoBerries platform. 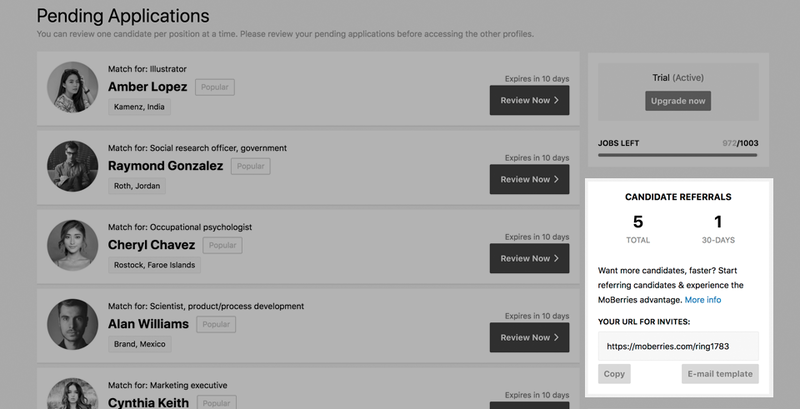 Select the integration partner you use to contact candidates. Leverage the perks of sharing. 1. 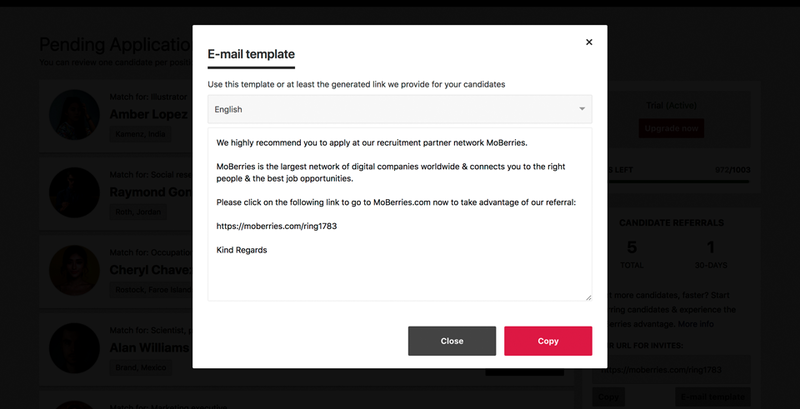 Head over to your MoBerries dashboard and scroll down to Candidate Referrals. Copy your referral code (URL for invites). 2. Click on the E-mail template to access our suggested text. You are welcome to tailor it to match your employer branding. Make sure your personal referral link is integrated, so we know which candidates were referred by you. 3. You can now send the template to your unneeded candidates! MoBerries matching accuracy actively improves based on your interactions and feedback. Sharing unneeded candidates is the path to achieving the 10 matches 1 hire benchmark. At no extra cost, show candidates that your brand cares. Help them find new opportunities within the network in real time. Every referred candidate helps us maintain the integrity of the platform. Thanks to the commitment of our network, we are able to create a transparent job marketplace, which works for everyone. With every candidate shared our offering grows stronger. MoBerries © 2018. All rights reserved. any questions & guide you through the process!